I was lucky enough to have the chance to borrow my friends Konad Stamper Kit. You will find that Konad kits can be pretty expensive however the designs are more to my taste than the others. You can get your hands on a cheaper kit at Bundle Monster. A usual kit comes with many silver discs containing different nail designs and tip designs, a stamper and a scraper. 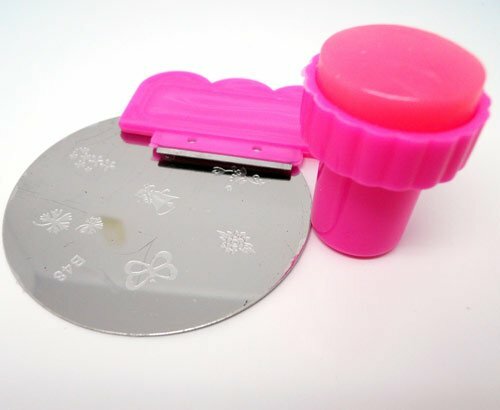 For those of you that aren't sure how it works....You begin by putting your desired nail colour over the design you choose on the disc. You then use the scraper to ensure the polish goes into the design. You then need to immediately use your stamper and roll it over the design, then immediately roll it onto your nail. It can be very tricky as you need to be quick so that the polish doesn't dry. Make sure you use a top coat to finish. As you can see above, I tried it with the feather design. I like the way it has come out however I am still trying to get good at it before purchasing my own kit. If any of you have done this already or are looking to try it then please let me know! Good luck! Wow these are so cool!! Totally going to look into these and tell my sister too as she loves nail art aswel.